2018, November. What else could context possibly be? Expanding social psychological definitions of context through the study of racial identity construction. ERCOMER - the European Research Center On Migration and Ethnic Relations monthly seminar series, University of Utrecht, Netherlands. 2017, October To be or not to be? Racial ascription and private racial identity construction among multiracial Malaysians and Singaporeans. Conference on “Mixed Race in Asia and Australasia”. Asian Research Institute, National University of Singapore, Singapore. 2017, February Migration among the diaspora: The construction of racial identity for the access of privilege and belonging. Interdisciplinary Lectures and Roundtable Discussion “Fractured Stories? Narratives of Migration”. Ertegun House, University of Oxford, United Kingdom. Reddy, G., & Sankaran, S. (2019, February). Broadening global understandings of identity using South and Southeast Asian perspectives. Presented at Towards a Decolonial Psychology: Theories from the Global South, South Africa. Reddy, G., & Gleibs, I. H. (2018, July). Endurance And Contestations Of Colonial Constructions Of Race. Paper presented at Society for the Psychological Study of Social Issues Conference, United States. Reddy, G., & Gleibs, I. H. (2018, June). Endurance and contestations of colonial constructions of race among Malaysians and Singaporeans. Paper presented at 10th International Conference on the Dialogical Self, Portugal. Reddy, G., & Gleibs, I. (2017, March). “Maybe because a lot of colonialism rubbed into me”- Constructions of race in Malaysia and Singapore and its impact on intergroup relations. Presented at the biannual meeting of International Convention of Psychological Sciences, Vienna, Austria. Reddy, G., & Gleibs, I. (2015, July). The influence of government level racial categorisation on the negotiation of ethnic identity among mixed ethnicity Singaporeans and Malaysians. Presented at the annual meeting of the International Association for Cross-Cultural Psychology, San Cristobal, Mexico. Reddy, G., & Gleibs, I. (2014, September). Structural Influences in the negotiation of mixed ethnicity among Malaysians and Singaporeans. Presented at the annual meeting of the Association of Southeast Asian Studies in the UK, Brighton, UK. Reddy, G., & Gleibs, I. (2012, July). Through the lens of a mixed ethnicity Singaporean. Presented at the annual meeting of the International Society of Political Psychology, Chicago, USA. Reddy, G. & Gleibs, I (2017, July) Private and public racial identities among multi-race individuals: How everyday engagements with government policy shapes racial identity construction. Presented at the tri-annual meeting of the European Association of Social Psychology, Granada, Spain. Reddy, G. & Gleibs, I (2016, July) Maybe because a lot of colonialism rubbed into me” Constructions of race and its impact on intergroup relations. Presented at European Association of Social Psychology Summer School. Reddy, G. & Gleibs, I. (2014, July) Negotiating Ethnic Identities: Through the lens of mixed ethnicity Singaporeans and Malaysians. Presented at the tri-annual meeting of the European Association of Social Psychology, Amsterdam, Netherlands. Reddy, G. & Gleibs, I. (2012, June) Identity negotiation among mixed ethnicity Singaporeans. Presented at the annual meeting of the Centre for Research on Nationalism, Ethnicity and Multiculturalism, Guildford, UK. Reddy, G., Coultas, C.J, Albayrak, N., Lukate, J. & Okoroji, C. (2018, August) The Politics of Voice in researching individuals in contexts of Percarity. 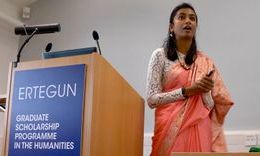 (Chair: Geetha Reddy) at the annual Social Psychology Section, British Psychological Society Conference, Keele, United Kingdom. Reddy, G., Lukate, J., Ferenczi, N, & Sedique, N. (2017, March) Identities in Context: Meaning making in the identity construction, negotiation and identification processes across different contexts (Chair: Dr Rochelle-Ann Burgess) at the biannual conference International Convention of Psychological Sciences, Vienna, Austria. Psychology and Society, Journal of Integrated Social Sciences, Journal of Social and Political Psychology, Ethnicities, Papers on Social Representation.